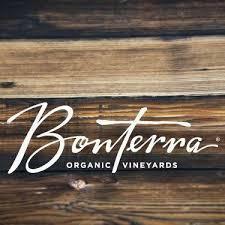 Bonterra wines are a natural expression of the unique climate and soil of the Mendocino coast. The name "Bonterra" means good earth. All of their wines are nurtured from organically grown grapes. Bonterra relishes the re-discovery of age-old traditions of viticulture, working in harmony with Nature, to create wines with pure, concentrated flavors. We honor the land by farming organically, creating rich soils that provide healthy vines the opportunity to deliver wonderfully flavorful fruit. With every sip of Bonterra wine, you can taste our natural commitment. There's no other way to fully capture the expression of our Mendocino terroir. "Mendocino, CA- An initial impression of rich, buttery cream quickly turns to aromas of honey and lightly toasted almonds, followed quickly by tropical aromas of pineapple, citrusy lemon. Pear and citrus note appear on the palate balanced by a dollop of oak. Organically Farmed." This Pinot Noir has aromas of strawberry, raspberry and cola accented with hints of oak spice and vanilla. In the mouth, this wine is rich with nice soft tannins and flavors of berries, vanilla and spice that fade into a lovely long finish. Wine Enthusiast 91"This wine wine has aromas of black currant, black cherries and a touch of wood smoke with flavors of plums, dark berries, toasty oak and vanilla spice. In the mouth, this wine has an elegant and restrained style with nice structure and balance, soft tannins and a long finish." "This Cabernet offers aromas of bright cherry, currant and raspberry with notes of toasted oak and vanilla. In the glass, you will find flavors of cherry and currant and a lingering and thoughtful finish. Good structure, a moderate weight, polished tannins and balanced acidity." "This organic wine has aromas of black currant, black cherries and a touch of wood smoke with flavors of plums, dark berries, toasty oak and vanilla spice. In the mouth, this wine has an elegant and restrained style with nice structure and balance, soft tannins and a long finish"
This light-bodied wine made from organic grapes seems earthy at first whiff but settles down to crisp citrus flavors, good cleansing acidity and very fresh herb and melon flavors. Intense aromas of citrus, grapefruit and fresh cut grass greet the nose. As you drink, the crisp acidity makes this wine particularly refreshing. The wine has aromas of white flowers, apple, pear, peach, honey and clove with an underlying minerality and classic Riesling spice. In the mouth, it is a balance of crisp acidity and subtle sweetness with a long rich finish. Wine Enthusiast 90 Best Buys " Fresh and vibrant grapefruit, lemon and crisp apple aromas join equally lively citrus flavors in this medium bodied, not-too-tart wine. It’s refreshing and clean, pairing especially well with seafood. " " There is no mistaking the New World style of this wine.